Armenia finally has a parliament representing its post-“revolution” leadership, as the new National Assembly gathered for the first time and started to select its leadership. It took several weeks following the December parliamentary elections to calculate the number of MPs in each faction under Armenia’s complex rules. In the end, the My Step faction of Prime Minister Nikol Pashinyan has 88 seats in the current parliament, Prosperous Armenia (led by oligarch Gagik Tsarukyan) has 26 and Bright Armenia (a pro-Western party allied with My Step) has 18. 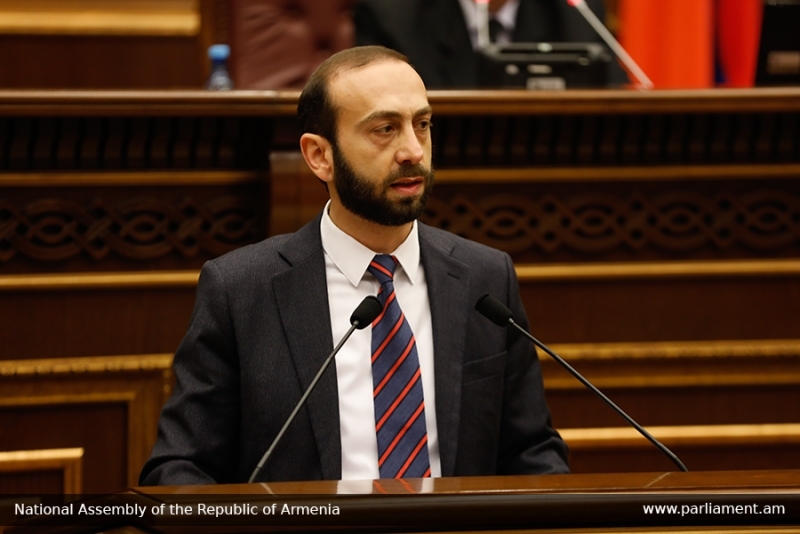 In its first sitting, on January 14, Ararat Mirzoyan a former deputy prime minister, won the speakership unopposed. It was a striking rise for a man who, less than a year ago, as a backbencher opposition MP lit colored flares inside the National Assembly chamber in support of Pashinyan, who was at the time on a long march to protest a power grab by former leader Serzh Sargsyan. “Now we are talking about a truly elected parliament,” Mirzoyan said following his election. But the following day, the battle over the position of deputy speaker proved to be more confrontational. The opposition is guaranteed one deputy speaker spot, and the two candidates for that post were Vahe Enfiajyan of Prosperous Armenia and Mane Tandilyan from Bright Armenia. The two candidates stood in stark contrast. Tandilyan is a well-respected politician and prominent activist; under Pashinyan’s first government she served as minister of labor and social affairs. Enfiajyan, meanwhile, made headlines in the election campaign for heading a scheme to create fake Facebook accounts to make it appear that Prosperous Armenia had broader support than it actually did. My Step supported Enfiajyan on the principle that Prosperous Armenia deserved the post by getting the second-largest number of votes in the election, though many members made clear they weren’t happy about voting for him. “If we choose a person of course I would go with Tandilyan but we feel that we have to give our votes to the party that got the most votes,” said Lusine Badalyan, one My Step MP, in a TV interview the day before the vote. In her speech ahead of the vote, Tandilyan argued that My Step MPs should vote their conscience and to represent their own constituents, not to try to represent Prosperous Armenia. “Make your choice for the citizens that voted for you, not for the citizens that didn’t,” she said. Her argument failed to sway the MPs, though, and Enfiajyan won with 108 votes. Tandilyan’s 19 votes suggested only one MP not in her faction supported her. “In the National Assembly, the difference of opinion is close to zero,” quipped one former MP from the Heritage Party, Karen Aslanyan, in a Facebook post. The two remaining deputy speaker spots were won by two My Step candidates: Alen Simonyan received 109 votes and Lena Nazaryan, 124.